In our social media-enabled, always-on world, we think we can solve most problems with our networks, but there are still millions of users across the globe actively using one of the oldest forms of online conversation: Message Boards. Andrew Sider, founder of Bunch recently chatted with me why he (and several investors) think that cutting edge message boards are a hot new opportunity for online communities. Karen: Message boards are arguably the oldest form of the web. What's wrong with them, and why do you think they need updating? Andrew:Over the last 10-15 years the Internet has evolved a lot, and we've seen the creation of our favorite online platforms. But message boards haven't changed since the dawn of the Internet. They are fragmented across the web, have outdated UI and are riddled with trolls. Message boards have not kept up with cultural expectations of Internet products, and I don't expect our generation will use them in twenty years. We created Bunch to unlock the value of traditional forums by improving the things that make them unattractive to the mainstream Internet user. 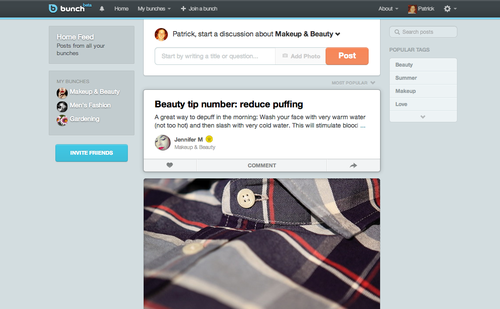 Firstly, Bunch is a platform so members can conveniently manage multiple topic-based networks in one place. Secondly, the interface is familiar and easy to use. 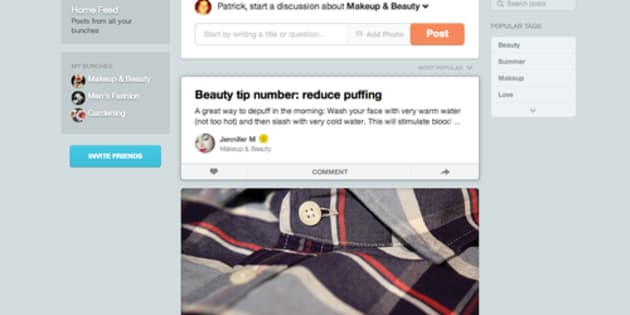 On Bunch, content is consumed in a feed and the product has features like social signup and allows members to easily share to other social networks. Most importantly, Bunch is available on web and mobile, so members can browse and keep up with discussions on the go. Karen: Online discussion seems to have gone niche in different directions. To get questions answered, you can use yahoo answers, or sites like Quora for an expert opinion. What's different about Bunch? Andrew:Bunch is all about deeper engagement around topics you care about. We designed the product to be a blank canvas for members to publish opinions, thoughts, questions, or articles and then engage in discussion with other passionate people. We built Bunch for people who want more than 140 characters to express their thoughts on a topic. Content is typically longer form and results in free flowing discussion where members exchange, debate and evolve ideas. 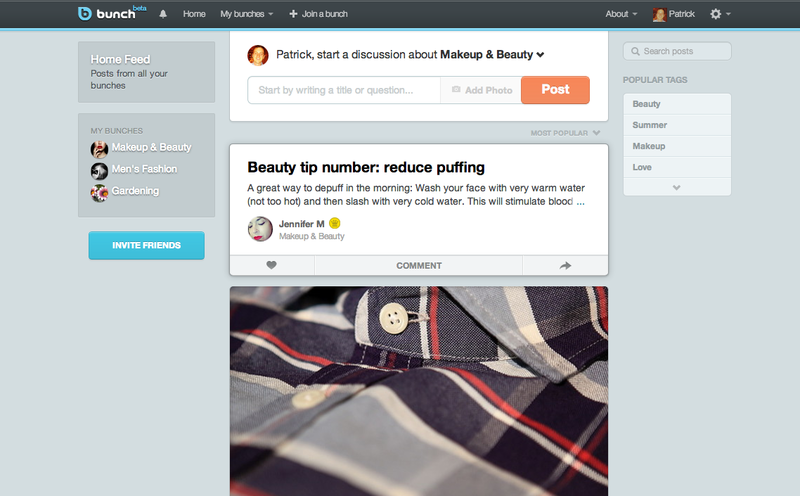 Karen: Bunch seems to pair discovery (like prismatic and pinterest) with discussion boards. What do your usage patterns look like? Do they favour one over the other? Andrew:We started with a focus on publishing and discovery. Meaningful discussion requires meaningful content. We spent a lot of time trying to understand what meaningful content looks like and how to make it easier for people to share it on Bunch. For example, we analyzed other social networks and found that photo-based posts tend to get a lot of one click reactions, such as Likes, while text-based posts drive more comments. To encourage the creation of meaningful content, we designed Bunch posts to require a title and some text must accompany than just a photo. We found this format best for letting members quickly browse content to find what's relevant to them, and for generating engaging comments. To make it easier to share this type of content, we offer members a bookmarklet so they can easily share to Bunch while browsing the web. We also built a way for members to import their Tumblr blog posts to Bunch, which we manually curate to ensure content is discussion worthy. We'll soon expand to import other blogs as well. Great discussion requires some membership density around topics, which can be challenging in the early days. As the Bunch community grows I expect conversations to naturally become more of the focus and value of the product. Karen: Do you moderate discussions which happen on bunch? Andrew: We provide all new members with a copy of Bunch etiquette, a set of guidelines on how they should engage on the site, but there are always a couple bad apples. We have a few manual and automated efforts to address this. First, we built an algorithm that surfaces the best content to top of your feed, relying on signals such as the number of comments on a post. We also give members the ability to report inappropriate content or activity in their feed. It's pleasantly surprising how much members want to protect the quality and integrity of their communities. Lastly, there is manual moderation by both Founding Members and Bunch's internal community managers. A Founding Member is our version of a traditional moderator. They are a member chosen by our team to be a host of their bunch. They are extra passionate about the chosen topic and their role is to keep their bunch welcoming, on topic and also comes with perks like swag and access to the Founding Member bunch. Members apply to be a Founding Member on our website and all applications are reviewed by our team. Karen: Why is it important that you limit users to 3 topics? Andrew: Most sites let you like or follow thousands of "interests". And it's because online services offer us this infinite choice that these actions lose their value. The reality is we don't really care about that many things, let alone have the appetite to discuss them. To create an environment with deeper engagement around topics, we wanted to emulate offline realities where you have limited time and money, and focus on the things that matter most. At Bunch, we call these your passions. They probably represent the two or three hobbies mentioned at the bottom of your resume. Limiting members to three bunches was a design decision we made to build communities of passionate people and to ensure quality of conversations as we scale. It is the shared passion of members which makes Bunch the best place to share topics you care about. Members can still bunch hop, but the added friction of only joining three at time has helped keep trolls at bay - a problem on most discussion products. We're considering ways to let members to join more bunches while maintaining quality of the community, but it will probably be given as a reward to active and reputable members. Karen: Why do you ask for real identities? Andrew: Most existing discussion products allow anonymous accounts, which can lead to spam and unproductive conversation. With Bunch we wanted to build a place where online conversation feels more like real life, as if you're at a cafe or a conference, enjoying a drink, face to face. The social dynamics of these in-person encounters keep us accountable and conversations civil. Having members use their real identity on Bunch is an important part of creating this environment. It also allows us to help build the reputation of members as topic experts, so they can benefit from that reputation offline as well as online. Today we ask members sign-up with Facebook connect to validate their true identify. We suggest members use their full real name, although they have the option to only use the first initial of their last name. Karen: How did you go from concept to minimum viable product? Andrew: We built several MVPs. I'm a big believer in getting a product out quickly and iterating with user feedback. It frustrates me to see some entrepreneurs build in a vacuum for six months only to have their hypothesis proven wrong when they launch. We built the first version of Bunch very quickly. It wasn't pretty, but it got the vision across. We released it in closed beta to a small group of friends and family and constantly bugged them for feedback. As the product progressed, we used private invite links to signup more beta testers, while continuing to look at our metrics and conducting bi-weekly user calls for qualitative feedback (the numbers were too small at the beginning to be conclusive). Karen: When did you decide it was time to do a raise? Andrew: I knew from day one that Bunch would raise venture funding. This was (and still is) a go big or go home opportunity. I set out to build a global media company around meaningful discussion, and if done right, I knew it would be a billion dollar company. It took several months to get started. We built a small team and iterated on the first version of the product, all founder funded. Once we had a bit of traction and a product that communicated our vision, we decided to raise venture funding to accelerate the company's development. Karen: What was your experience on the money trail like? Andrew: I've raised money a few times and it's never an easy task. The same was true for our latest funding round. It always takes up more time than you expect and it feels like you're taking time away from running the business. But at the end of the day, it's a really important process for any founder. It helps you challenge and hopefully confirm your beliefs about the business, and also ensures you have the supportive funding partners you need to build out your vision for the company. A side note to Canadian entrepreneurs - there has never been a better time to be an early stage tech startup in Canada. With a growing number of accelerators, VCs, government subsidies, and American investors investing North of the boarder, early stage companies have more access to capital than ever. Karen: What was the part of your pitch that got you to a yes? Andrew: No investor will invest in one data point. They need several. That might change if you've had a grand slam success in the past, but I've only had singles and doubles so far. Bunch was able to raise seed funding because of the combination of a great team, a big vision, and some early proof points on the product. Karen: Now that you've raised your money, what do you plan to do with it? We're still laser focused on building out the product and creating an experience users love. Specifically, we are building tighter integration with other networks to reduce the friction of sharing and discovery on Bunch. We'll also focus on building Bunch across multiple platforms. We're already on web and iPhone. Android is next, followed by iPad soon after.